Each cartomizer can now be ordered seperately. Mix and match flavors and nicotine levels as you please. The "Regular" lasts around 380-400 puffs. 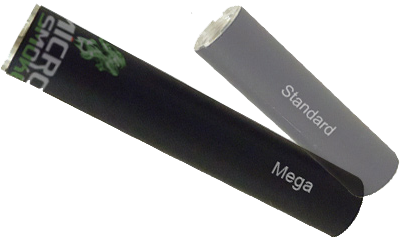 The new "Mega" type lasts 780-800 puffs. Try our new Mega's - a long lasting great taste! We offer the 2-part e-cig: all our cartridges have a built-in atomizer. Just screw on your atomizer and puff! Our cartomizers have the highest "smoke" volume, and most intense flavor in the industry, giving the user a real smoking experience. These are our most popular flavors and strenghts. Any other flavor can be made available in time, just let us know what you are looking for! The Latest in Cartomizer Technology is in, called Mega Cartomizer! Price: only 30% higher than the regular size cartomizer, but double the puffs! We have both long and short USB chargers, depending on your need. We find that the short USB chargers are great for charging on laptops and from computer towers, and are convenient in cars as well. Long USB charger cables are really great when you want to plug your battery in and leave it charging on a table or nightstand for easier access. Depending on your vehical console, the long USB may be just right for you as well. Whichever you prefer, we have them both! Cartomizers are so called because in the newer 2 part electronic cigarettes the atomizer is now disposable and contained inside the cartridge. Now, instead of taking it all apart, cleaning the atomizer, and screwing a new cartridge on, you just take off the used cartomizer, and put a new one on. It couldn't be any simpler or more convenient to use.